ALL Balotelli asked was for a petite peck, England dithered and now look what the Queen has done – or NOT DONE! He may be the next Walter Mitty with Michael Jackson gone, but surely, progress in the World Cup is an acceptable price to pay to appease the idiosyncratic tantrums of bold and brash Balotelli – however bad or bird-brained he might be! For those still like stuck under some coconut shell, the kiss was what football’s enfant terrible Mario Balotelli cheekily tweeted on Friday, the eve of Italy’s crunch match against Costa Rica. This was the sweetener he would like from England should Italy be persuaded to break sweat and beat Costa Rica in the current World Cup. 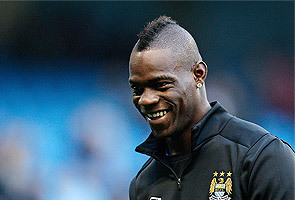 Italy striker Mario Balotelli wants a kiss from the Queen if Italy keep England's World Cup hopes alive. England have a slim chance of qualifying for the knockout stages if Italy beat Costa Rica, and the Azzurri striker tweeted: "If we beat Costa Rica, I want a kiss, obviously on the cheek, from the UK Queen." Manchester City defender Vincent Kompany, 28, tweeted in reply: "Wouldn't even surprise me." It would be safe to assume no telegram came by Royal Appointment (would it be too much to expect; complete with regal pomp and splendour, delivered on silvern liveried horseback and medieval glass carriage) and England’s fate was sealed. Spurn him, then welcome to feel the pain! So when Italy marched in the stadium, it would be fair the length and breadth of – England; if not Scotland, were rooting for a Neopolitano victory. The Italians? Over-confidence perhaps, or maybe the sleight from the lack of response from Buckingham Palace being taken as a rude slap-in-the-face, they capitulated. So when they allowed one goal past their keeper – scored by Fulham player Byran Ruiz; clearly a case of not paying back English hospitality – I thought nothing of it; thinking Italy would wake up and put things right. As the minutes ticked on, I thought this could not be true. Costa Rica stood firm and repelled all the Italian raids mounted with increasing urgency. So when the final whistle went, everyone looked for words to explain this football anomaly, except the victors! Costa Rica is a good team, with many of their star players plying their trade in Europe. So Italy’s path now depends on their final game against Uruguay – a draw will be enough though to see them through to the last 16. Lose and Cesare Prandelli's boys will have mouldy pizza served each time they sit to a meal in Rome. For England, double irony, they need to root for Uruguay to win – a tall task if the hope of the entire England lies on the exploits of – Luis Suarez, again! Over in San Jose, the capital of Costa Rica; there were wild scenes of celebrations. They roundly told the world that their team did not come to Brazil just to make up the numbers it seems – they actually want to win! Reaction from Roy Hodgson was rather blasé and complacent. He has expressed a lack of regret for the England’s untimely exit. Indeed, he looks likely to remain in charge when the next big football cup is up for grabs for European nations – the Euros in two years time. Frank Lampard and Steven Gerrard, good players they may be, but like some afflictions Malaysian sportsmen know only too well, are merely jaguh kampong. Put them on the world stage where it matters – the World Cup – and they fail to achieve the ultimate – the pinnacle of their profession. If England were to eke out any consolation from this trip, they have a chance. They meet Costa Rica on Tuesday for their last group game but by then even an English win might still not be enough. The Costa Ricans need only extract a draw for one point and they’d have enough to sail through as Group D winners. England’s misadventure comes in stark contrast to that of one of my 3 favourite teams – La Belle Francoise. Le Blues continued with their good start, cementing their opening victory against Honduras with a 5 – 2 victory over the European challengers Switzerland. Something must be right with the French this time, as their progress has not been marked with hissy fits from pampered professionals that was the story from the last World Cup. Missing star player Franck Ribery – one of their handful of Muslim players, they could afford to miss one penalty in their flattering victory. I do hope they go through and feature in the final come July 14. Allez Allez Allez! As for England, they can turn a snooty nose at France for having been Napolean’s conqueror, but football and the World Cup is far more important than faded history. It could all have been different - if only the Royal House of Windsor threw regal decorum to the winds and humoured Balotelli’s plea!